When I came across this book a few years back, it was like finding buried treasure. It’s one of those books that can be had for a song on Amazon but is worth so much more. Lots of beautiful houses featured from large historical homes to lovely cottages. 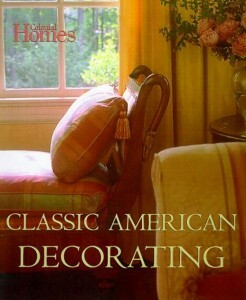 Book is filled to the brim with gorgeous, rooms decorated in classic, timeless style. 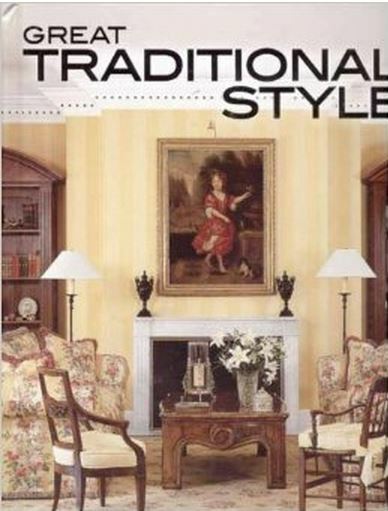 If you love traditional, never-goes-out-of-style design, you’ll love this book. This is a book I pull off the shelf over and over to enjoy. Psst: The cover doesn’t do it justice…so don’t judge this book by its cover. Book is divided into four sections: Stately Revival, Rooted in History, Collector’s Delight and Lighthearted Spirit. Large variety of home styles and designs featured including: Tudor, Cape Cod, Greek Revival, Colonial, Farmhouse, Lake house and many others. There are so many rooms inside this book that I would love to lift right out of the book in their entirety, and place directly inside my home, changing nothing. Lots of gorgeous antiques. I want the bed on page 185, the cat can stay, please. 🙂 I’ll take every single room featured under the chapter, “Masters of the Hunt.” Gorgeous bedroom on page 112…would love to know where that rug came from! Beautiful vignettes and ideas for displaying books and blue/white china on page 194-195. 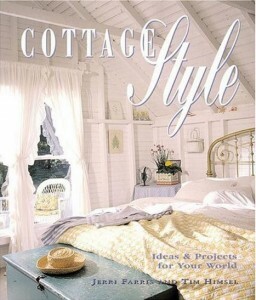 I love the French style bedroom on page 200. I could go on and on! You can read more about this book, GREAT TRADITIONAL STYLE at Amazon where I normally buy my books, via the picture link below. Previous PostCelebrate St. Patrick’s Day! Sherry if you love beautiful, classic decor, you’ll love it! It’s funny you introduced the book Great Traditional Style. I just bought that book last week[ at my local Marcs for $ 1.99. And you are right, it is wonderful and has such beautiful pictures. I loved it and was so happy to find it at Marcs. It is a wonderful book- I have it in my library too. 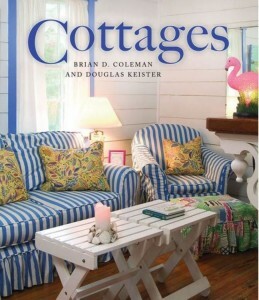 Another book that you might enjoy( even more:-) is SOUTHERN LIVING STYLE. The colors used are gorgeous!! I don’t have that one and it looks great! Thanks for telling me about it, Dolores. I wonder if they ever printed it in Hardback, I only see paperback on Amazon. Hi Susan- yes, it was published in hardcover.I know for a fact because my copy is in hardcover . I just had a look on ebay for the book, and found it there in hardcover for $4.99 free shipping.. There are many copies on Amazon in hardcover..
Yep, I just purchased it in “Like New” condition on Amazon. I don’t trust the ones that say “good” because so many are ex-library books and I just don’t like it when they are stamped all through with the name of the library. Thanks for suggesting it. I’m sure I’ll love it since it’s from the Editors of Southern Living.